Markham is the best of the best when it comes to his job as a contract killer. Until the day, he finds himself on the brink of death after a job gone badly. Markham finds himself lying on an operating table in the back of an animal hospital as his friend Sutton works frantically to save his life. After flat lining and getting a sneak peak of what the afterlife holds for someone of his caliber, he returns to his earthly body vowing to save a life for each one he has taken over the years. 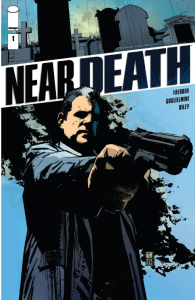 Hoping that it is not to late to balance his judgment scales and earn a spot in heaven in Near Death #1 from author/co-creator Jay Faerber, artist Simone Guglielmini, and co-creator/cover artist Daniel Freedman published by Image Comics. While the story set up has been done a billion times at least, the realism behind the main character Markham makes up for it ten fold. Early on in the first issue, I developed a bond with the character thanks to some very clever writing from Jay Faerber. 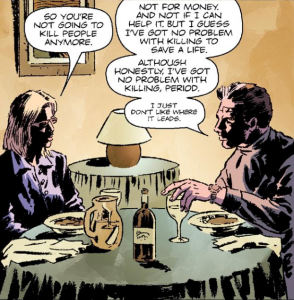 I am highly looking forward to deeper looks into the relationship between Markham and Sutton, the first issue left me curious to how things would pan out for the duo as the series continues. 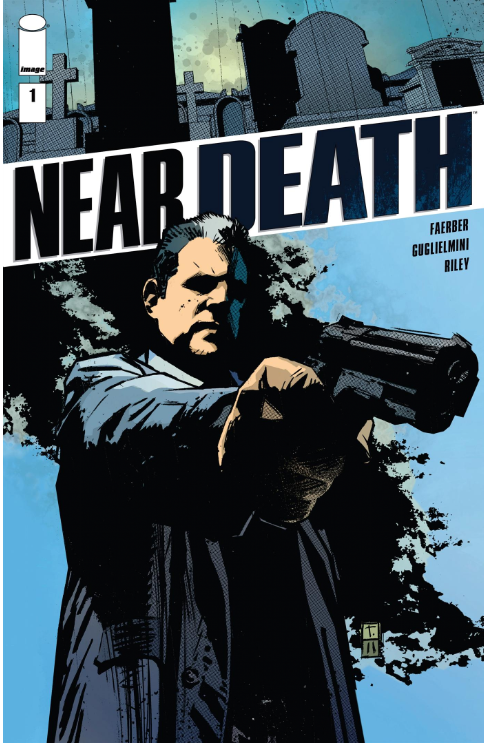 As a huge fan of gritty crime stories, and noir style comics I was quickly sucked into the world of Near Death. I have always been a sucker for the hit man who has a change of heart, and tries to distance himself from his old lifestyle scenario, or in the case of Markham vows to redeem himself by using his talents for good. I really enjoyed the looks the series takes into the mind of someone who kills for money, and the trademarks they take on over time that in some cases can lead to their own demise, due to being to predictable in the eyes of their peers. The sense of urgency shown after Markham’s return to the living to change things really get the point across that he is was authentically scared by what he saw on the other side, this is a factor in similar stories that often seem uninspired and sped over, where as Near Death handles it perfectly. I really dig the simplistic yet gritty feeling art style and feel it really adds to the overall feel of the book. It has a very dreary feeling to it that perfectly captivates the emotions that Markham must being experiencing after such an eye opening and life changing event. Simone Guglielmini is able to seamlessly convey the same feelings the story are creating visually making the experience so much more memorable.